"When you are 233,000 lbs and your trailer breaks it doesnt leave many travel options available," said state police. The Nebraska State Patrol had their hands full over the weekend when an oversized load broke the equipment that was hauling it, forcing crews to get creative to find a solution. The incident began on Saturday, February 9, on Highway 34 near Grand Island, Nebraska, according to a report from NTVABC. A truck was hauling an industrial boiler to a final destination in Denver when the trailer broke under the weight of the heavy load. “Their trailer failed and actually broke in two,” explained Mike Lilienthal of MRL Crane. “When you are 233,000 lbs and your trailer breaks it doesnt leave many travel options available,” the Nebraska State Patrol said in a tweet. The boiler weighs about 150,000 pounds. The total weight of the boiler and trailer was 233,000 pounds, according to the Nebraska State Patrol. All lanes were reportedly blocked and authorities were forced to close down Highway 34 between Stuhr and Shady Bend Road. 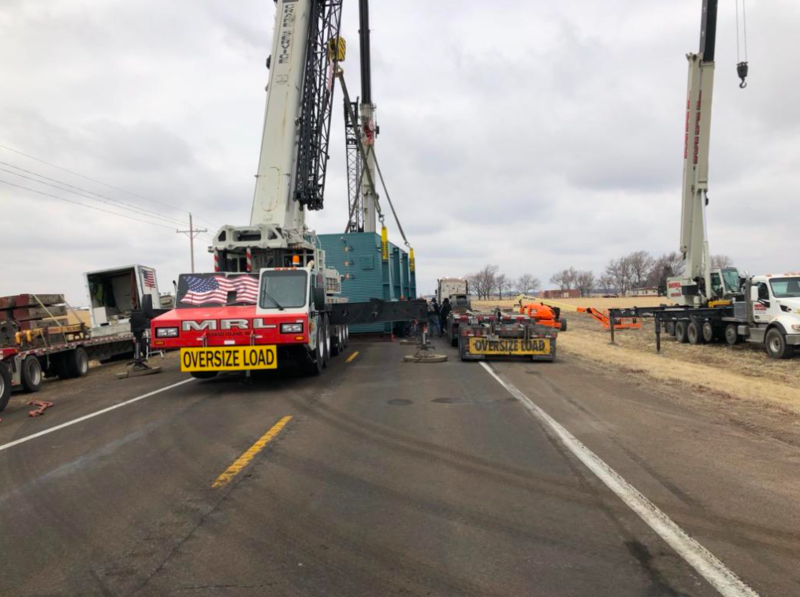 Nebraska troopers, the Nebraska Department of Transportation, and MRL Crane Services worked to repair the broken trailer on Saturday afternoon and into the evening, but their efforts were unsuccessful. On Sunday, crews tried a different tactic to get the boiler moving again. “Today we went back with two large cranes, the boiler weighed about 150,000 pounds, they sent another trailer up from Oklahoma City. We took it off the old trailer and set it on the ground, waited until the new trailer got here and set it on the new trailer and now they’ll wait for permits until tomorrow and then they’ll continue on to Denver,” Lilienthal said. More than 24 hours after the trailer broke, Highway 34 reopened. The boiler has resumed its trip to Denver. Lilienthal remarked that he had never seen anything quite like this in his 30 years of experience. “It’s very unusual that an equipment would fail in transport,” he said.